The ARC YOUTH programs are implemented currently by YWCA programs, Faith communities, public and private schools (including a Gates Foundation Idea Public School), and in other community agencies and organizations for Teen Pregnancy prevention and in detention centers to enhance emotion management and wise choices. The ARC YOUTH programs have also been utilized for Teen Pregnancy prevention and in detention centers to enhance emotion management and wise choices. Our youth programs are a great way to improve attitudes and relationships at home and at school. These programs extend to other situations as well, preparing participants for the future. Our curricula introduce and cultivate valuable life skills that enable youth to improve in many important ways. Understanding how emotional triggers and stressful situations affect the body and mind is very critical for youth. This allows them to learn good, healthy habits early on, paving the road to becoming a well-adjusted adult. Another important aspect of developing good habits early on is preparing for the workplace. Work can be very difficult, especially for youth who have not yet learned how to manage emotional upsets and triggers. The tools taught in our youth programs will help people reach a whole new level of psychological strength. Our programs have been utilized in both schools and incarcerated settings, including juvenile halls and boot camps. This course prepares youth with high-level emotion regulation skills and skills to accept personal responsibility for their careers, family, and future. ARC has the capacity to train and assist you in implementing a 12-session course for your middle and high school students district wide. Your district officials determine where, when and how many and ARC will work to provide the materials and the experts. Life can be difficult, especially for teenagers. At that age, most people are just beginning to learn how to take care of themselves. It is not the age someone should have to worry about taking care of a child. Our programs for youth and young adults will help teens to better understand life and how to exercise control and make wise choices. Specifically, ARYA has shown dramatic teen pregnancy prevention effects in two Texas communities being served in a Community-Based Abstinence Education grant to the Medical Institute for Sexual Health. Based on two years of data (2007-08 and 2008-09), there has been a 30% decrease in teen pregnancies in the Fabens Independent School District and a 25% decline in the San Elizaro School District, both in El Paso County. The Fabens ISD teen birth rate declined from 100 per 1,000 teen girls in 2006-07 to 47 per 1,000 in 2008-09, while the San Elizaro ISD teen birth rate declined from 123 per 1,000 to 108 per 1,000 during the same period. As compared to the pretests on the ARYA curriculum, there were significant changes in knowledge, attitudes, beliefs, intent, and self-efficacy to remain abstinent among the students who participated in the program and completed the pre-test and post-test surveys. Responses were received from 829 high school students in 2007-08 and 908 students in 2008-09. Baylor University and the Medical Institute for Sexual Health have conducted research on ARC’s Active Relationships for Young Adults (ARYA) program. These studies have shown ARYA to be effective and preferred by teens ages 13 through 19 in grades 8-12. The program has been deemed age appropriate, innovative, and culturally sensitive. Anger is an emotion that is natural and needs to be properly managed. Some people, especially youth, experience challenge in managing anger in a safe way because they don’t know how! Youth can develop skills through specially designed exercises and methods to navigate emotions in a safe way. ARC curricula also teach youth how to manage emotional triggers through skillful thinking so that they are better able to prevent emotional outbursts. The ARYA program is also utilized in juvenile halls to help youth attain practical skills to manage difficult circumstances for successful futures. Active Relationships Center’s programs are available for use by any person of any age and are even available for couples. 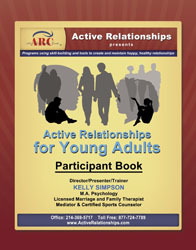 If parents would like to take a course parallel to the Active Relationships for Young Adults (A.R.Y.A.) course, we have a great companion course for adults, called Active Adults. This is a great way for moms, dads, and caregivers to learn the same techniques, values, and tools being taught to their youth. Active Adults will improve the parents understanding of themselves, their children, their spouse, and others – at the workplace and at home! * For families with younger children or teens, we offer a course called Active Families (for ages 3+) where you can learn valuable skills together through fun activities and games! Fatherhood is a wonderful thing and creates a a special bond, but being a father can be challenging. Overcoming obstacles and achieving that special bond can be tricky, especially under difficult circumstances. But with the right tools, methods, and a greater understanding of emotional issues, achieving and maintaining that special bond will be easier than ever! Try our Active Adults course and refresh your mind on important life skills, and how to maintain a great relationship with your children. Teens may learn the same principles through our youth program, Active Relationships for Young Adults. For families who wish to learn together in the same room, we offer a program called Active Families (for ages 3+). In this great program, parents and children can learn valuable skills together while creating memories and building strong bonds through fun activities and games! Mothers are very important to children. However, developing and maintaining that special bond with children is not always easy. To enhance a mother’s emotional skills and relationship with her children, try our Active Adults course. In this course mothers will cultivate existing life skills and learn new skills and methods to help create and maintain a better relationship with their children. For families who wish to learn together in the same room, we offer a program called Active Families (for ages 3+). In this great program, parents and children can learn valuable skills together and create memories and strong connections through fun activities and games! Some of us are blessed to be caregivers and guardians of children when their parents are away. It is a joy and as parenting always is, a thrill and an exciting challenge. Whatever our stage is, there is always more to learn. ARC provides courses that can give you a leg up on great communication, emotion management (yes, even anger and increased patience and peace!). Our courses build skills for finding solutions, interpreting our own feelings and actions and those of our youth. Built not just on theory, but on practical evidence-based skills, participants say they feel much more confident and ready to implement new communication skills. Our Active Adults course can enhance caregivers’ skills and relationship with the children to whom they give love and care. If you are the caregiver or guardian of a teen you may also be interested to know that we have a program for them too! Teens can learn the same valuable information and skills, through our youth program, Active Relationships for Young Adults. If you have young ones to look after, you’ll be especially interested in our program that includes youth AND adults – together! For families who wish to learn together (Yes. In the same room!) ARC offers a program called Active Families (for ages 3+). In this program, caregivers and children can learn valuable skills together through fun activities and games! We look forward to assisting you in caring for those you love. What a gift you are.